Good architecture represents the perfect balance of aesthetics and functionality. Metal products from Locker Group offer creative ways to transform your interior projects into striking designer spaces. Ceiling panels can be used to separate two floors and also provide an innovative alternative to regular white ceilings. Suspending the panels to make a high ceiling less imposing is an interesting application. Locker Group can customise their metal products to fit the application, eliminating any concerns about lack of options. 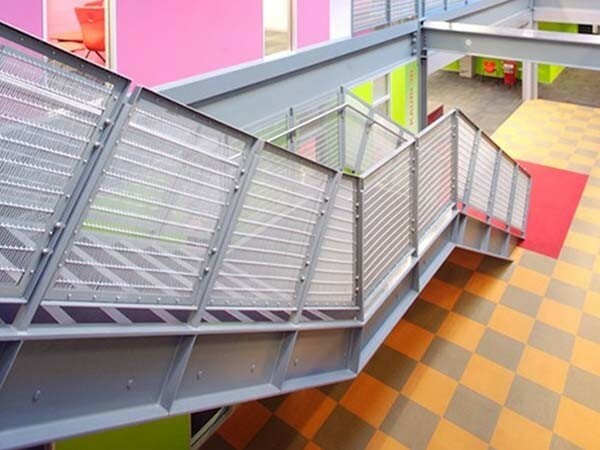 These metal products can even be supplied in a range of different colours. A great way to bring nature indoors, a vertical garden is a very popular trend today in commercial and residential interiors. Green walls are seen as an important way of harmonising urban living and the environment. Woven wire is a good material to use for creating vertical gardens as it provides climbers sufficient support to grow and thrive. Architects are increasingly showing a preference for linear ceilings where the panels are installed so that the ceiling appears to move in one direction. Often the lines are continuous without breaks. Locker Group’s perforated metal is an excellent choice for linear ceilings; additionally, its acoustical properties make the material ideal for environments that may have noise issues. Wire mesh curtains from Locker Group provide an excellent solution for partitioning large rooms into smaller spaces without impacting air circulation, unlike conventional walls. In addition to enabling a more open vibe, wire mesh curtains can also be used to conceal unseemly marks or electrical amenities. Think beyond the regular balustrade design of using one long piece of metal, and consider placing woven wire or perforated metal underneath the handrail to add more texture as well as enhance the safety of stairways.